"I like school a lot and want to become a nurse," says Asonah Nma, an AGSP scholar in Ghana. 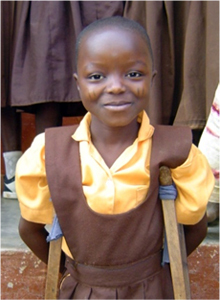 Asonah Nma is a second grade student at the Vea Primary School in the Upper East region in Ghana. When she was younger, Asonah was stricken with polio which left her handicapped. Her father is a farmer and her mother, a trader; occupations which are held by the majority of people in this part of the country. Bongo District is one of the most deprived districts in Ghana sharing its borders with Burkina Faso in the north. Asonah’s family is very poor and with four other siblings in the family, there isn’t much money to spare. With annual family incomes of less than $40 and a literacy rate of 30%, children here who find themselves able to attend school are fortunate. Asonah is one of these fortunate girls. Chosen to be an AGSP scholar through a transparent, participatory process done in her community, Asonah is very excited to be part of the program. "I like school a lot and want to become a nurse. For this, I have to work very hard. I was given a bag, pencils, books, uniforms, and a bicycle which my brother rides me to school on. These things encourage me to come to school every day," says Asonah. The Headmaster of Asonah’s school, Mr. Patrick Ababisa is very happy that the AGSP is implemented in his school. "Without this support, some of the girls would have left school. Bongo district is much in need," he says.